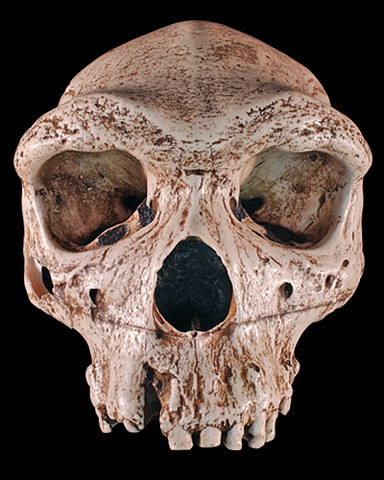 Broken Hill 1, or Kabwe 1, is noted is noted for its massive facial features, including a thick supraorbital tori, relatively large canines, and a receding frontal bone1. Despite its robust face, the zygomatic arch preserved on the right side is relatively gracile and post orbital constriction is minimal2. One of the most notable features on this fossil is the evidence for extreme tooth decay in 10 of the 16 maxillary teeth, and abscesses in the jaw1,3. Molars appear modern, in that the upper third molar is smaller than the first and second molars2. Schwartz JH and Tattersall I. 2003. The Human Fossil Record: Craniodental Morphology of Genus Homo (Africa and Asia) Volume 2. Hoboken: Wiley-Liss.